Today, I took a time out. 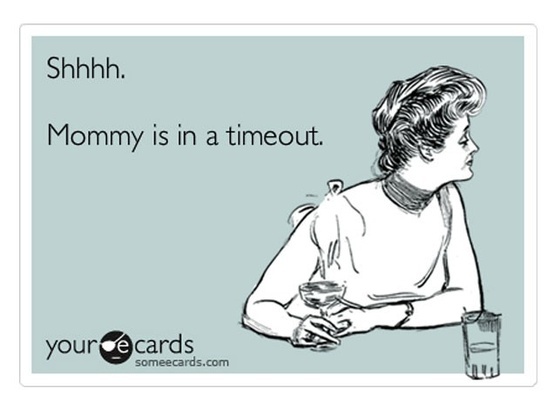 A mommy time out. It was long overdue, as it usually is for most moms. And it was sooooooooooo nice. I went for a massage, which happens to be hands down one of my absolute favorite things to indulge in. The problem is that for someone who loves a massage so much, I’m really bad at making it happen. My sister got me a gift certificate for a massage for Christmas….two years ago. I used it today. My massage therapist was shocked when I called for an appointment. She thought I died. When I was finally face down on her table we had a good laugh over the fact that the last time I had seen her for a massage, I was just newly pregnant with baby #3, and the time before that I had accidentally forgotten my wedding rings at her clinic. My marriage ended over 2 years ago. (Maybe that should have been a red flag???) Anyway, it got me thinking: My, how time flies between massages!!! Why is it so hard to make time for ourselves? Incidentally, my sister shares the same massage therapist who asked me to remind dear sis that she has TWO unused gift certificates that should really be used up! What the hell is wrong with us? Why does this angel with the magical fingers like warm butter have to beg us to come in and get a heavenly rub-down? Each time I leave her office, I promise that it won’t be nearly as long until I return next time, and every time I make a liar out of myself. Today, I vowed to change that. I have noticed that as mothers, we tend to put ourselves fairly low on the priority list. Now I know this sounds like a very canned statement and we’ve all heard it a million times, but it is repeated a lot because its true. And if I’m being honest, the reason for being low priority isn’t always because I love my kids and my family just so darn much that I just want to do absolutely everything that I can for them. Sometimes, the reason is that I am so depended on, taken for granted, and used up that I have no other choice but to keep trudging away and hoping that maybe someday, I will get to go do something all by myself for once! Sometimes, it’s the simple fact that I am so effin busy worrying about what everybody else needs or wants that I just don’t bother to make time for what I need or want. And sometimes, let’s be honest, it’s just plain easier to complain about not having time to yourself than it is to actually arrange it and follow through. And let me tell you ladies, I don’t care how loving and attentive your man or your children may be, I can guarantee they are not thinking about your needs and wants nearly as much as you are thinking about theirs. I’m not saying he doesn’t love you. I’m just saying that when you’re lying in bed at night staring at the ceiling and thinking about all the things you didn’t have time to do today and how many things you have to do tomorrow, he’s not worrying about what he’s going to make you for supper or whether or not he will have time to wash your yoga pants before Zumba class. He is lying beside you, snoring and dreaming of bacon. So what’s a desperate woman to do? Make some Damn Me-Time, Dammit! That’s Right. I said Damn, because that’s what women do when our kids aren’t constantly buzzing around us like a swarm of needy bees. We swear, and tell dirty jokes, and we complain about our kids. Among other things. (Or is that just me?) We commiserate about what it’s like to NEVER EVER be able to take a dump without somebody knocking on the bathroom door. (OR if you’re like me, having to leave it open because it’s quicker and less stressful to deal with what they want and get them out of your hair so you can finish your business.) But what do we do when we are, on rare occasions, by ourselves? I’ll tell you what I do with alone time. I sit quietly and listen to the glorious sounds of NOTHING. I enjoy lots of peanut butter, knowing that nobody is going to beg me to get up and get them a spoonful too and *GASP* SHARE. I fart without saying “excuse me!”. Maybe I get to leave the house! Oooh, that’s fun! Let’s see….I don’t need to buy anything but maybe I’ll just go wander around the stores and enjoy the fact that nobody is begging me to buy them something or “Look at This!” or OOPS “Cleanup on Aisle 3!”. I might even take something into the change room and try it on, taking the time to look at what this outfit looks like from the front AND the back, before anyone sneaks out under the door and escapes to play Hide and Seek. Today, I went for a massage, and when I got in my car afterwards, I didn’t want to go home. I went for a tan, not because I needed to but simply because I could. It had been years since I had lain in that warm relaxing bed with my eyes closed, the low comforting hum of the fan escorting me lazily off to sleep for a glorious 20 minutes of peace. If there is in fact a heavenly White Light when you die, that’s what I imagine it would feel like….a 20 minute tan. (Only you’re already dead so you don’t have to worry about Skin Cancer. BONUS!) When I eventually wandered back to the house, I was happy. Happy to see my family, happy for what I have, happy to be alive. And all it took was having 2 tiny little hours to myself. My point is that I’ve discovered that it’s called Me-Time for a reason. Nobody else is going to make it a priority but Me. If I need some time to myself, (and we all do), I just have to find a way to make it happen. It’s like exercise…it’s sooo worth the effort in the end. Sometimes we need to just Pause, Breathe, and Relax. Life gets stressful, and it’s easy to get overwhelmed and forget who we are for a moment. We’re mothers, we’re wives, we’re so many things to so many people. But first, we’re women. We’re individuals. We’re important. And we need some Damn Me-Time!